When productivity counts, the HR9016T™ by Jacobsen® is the perfect choice. With a 20 mph transport speed and a massive 16 ft. (4.9 m) width-of-cut, it can easily conquer over 100 acres of mowing in a single day. 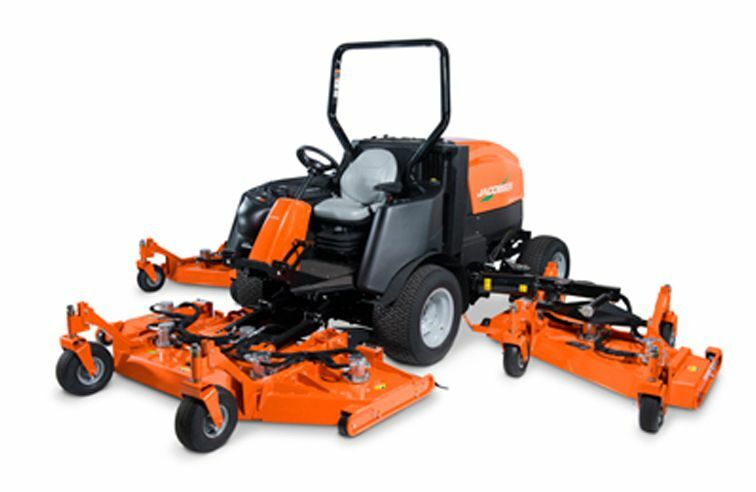 • New, more powerful 99.9 hp Kubota® turbocharged diesel engine is more fuel efficient and quieter. • Deluxe adjustable air-ride seat, tilt steering wheel, servo-controlled hydrostat and optional climate-controlled cab - reduces operator fatigue, provides total operator comfort. • Each blade individually powered by a quiet, pressure-balanced hydraulic motor - extremely durable, high cutting torque; no belts or greasing required. • Two outside deck winglets pivot up to 20 degrees - multiflex front deck reduces scalping in undulating turf. • Heavy duty breakaway system protects wing decks from damage. 6765 lbs. ; cab installed: 7308 lbs. ROPS: 90 in. ; Decks raised: 94 in. ; Cab installed with light: 103 in.